Pakistani paramilitary Rangers say “suspected militants” set fire to 27 tankers overnight that were carrying fuel for NATO troops in Afghanistan. But experts say the claim does not conform with the situation on the ground in the northern part of Sindh Province where the attack took place. The fuel tankers were set ablaze as they were parked for the night at a terminal on the outskirts of Shikarpur in the northern part of the country’s southern Sindh Province. Pakistani paramilitary soldiers stand guard as trucks and tankers carrying supplies bound for NATO forces in Afghanistan burn following the overnight attack in Shikarpur. The attack came less than a day after Pakistan’s government blocked the Torkham border crossing into Afghanistan further to the north. The Torkham crossing is a key link in a supply route for U.S. and NATO forces in Afghanistan. It apparently was closed in retaliation for the killing of three Pakistani paramilitary soldiers by an alleged cross-border NATO helicopter attack. The trucks had been carrying fuel from Pakistan’s southern port city of Karachi. They were meant to pass through Torkham and on into Afghanistan. But the closure of the Torkham crossing on September 30 left around 100 trucks backed up at the border and further south along the transport route. Abdul Hameed Khosa, the chief district administrator of Shikarpur, told RFE/RL’s Radio Maashal that it was the first attack against a NATO supply convoy in that part of Sindh Province. “These fuel tankers had been moving toward the Torkham [border crossing into Afghanistan] from Karachi through Baluchistan. 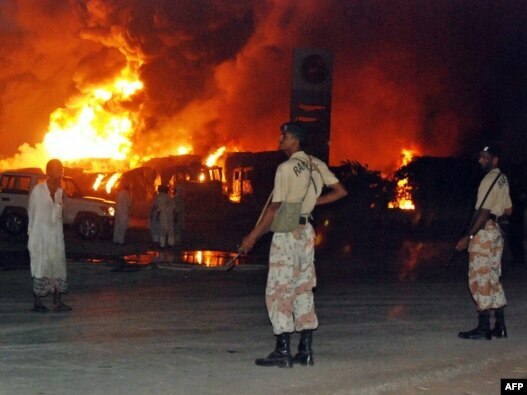 Ten to 15 armed people opened fire and set the fuel tankers on fire,” Khosa said. But Zia-ur Rehman, a Karachi-based political analyst and journalist, told Radio Maashal that those claims by paramilitary leaders do not conform with the situation on the ground. Rehman explained that the rural district around Shikarpur has never seen activity by pro-Taliban extremists. He said there is strong support in the area for the governing Pakistan Peoples Party, as well as some support for Sindhi nationalist factions. But Rehman said the Sindhi nationalists have no interest in attacking a NATO convoy because their grievances are with the government in Islamabad. “It is possible that it might be a reaction to the recent cross-border attacks by NATO. But the question is, ‘Who is doing this in Shikarpur?’ There are no Taliban here and Sindhi nationalists say they have no interest in such attacks [against NATO logistics]. So who is doing this? This is an important question that needs to be asked,” Rehman said. In the past, the United States and other countries have accused elements with ties to Pakistan’s ISI intelligence agency of helping Taliban militants — an allegation repeatedly denied by officials in Islamabad. In Islamabad, reports suggest tensions between Islamabad and Washington are soaring over the issue of NATO air strikes in Pakistani territory. On September 30, CIA chief Leon Panetta met in Islamabad with Pakistan’s President Asif Ali Zardari, Prime Minister Yousuf Raza Gilani, and Pakistan’s Chief of Army Staff General Ashfaq Parvez Kayani. Panetta reportedly remained adamant about the need to increase drone missile strikes in Pakistan’s tribal areas, saying the area was being used by terrorists to plan attacks in Europe and fan the flames of violence in Afghanistan. There has been an unprecedented increase in drone strikes in North Waziristan near the Afghan border. There also have been repeated incursions into the tribal areas by helicopters from the NATO-led International Security Assistance Force. That rise in drone attacks, nearly two dozen so far this month, has been linked to revelations of a terror plot being planned in the tribal areas for an attack against European cities. Meanwhile, there are signs of growing public anger across Pakistan about NATO air strikes in Pakistani territory. Fazal Khan, a Pakistani driver contracted to transport fuel for NATO into Afghanistan, told Reuters after he was stopped by the closure of the Torkham crossing that he supports the move. “The government should stop all these supplies. It should stop the supplies for two, three months so that [NATO forces] feel the pinch and they stop the massacre of Muslims,” Khan said. Protests have been scheduled near mosques across Pakistan at the conclusion of today’s Friday Prayers.